Back in October of last year, Mockingbird received another Cease and Desist Demand – this time from Jesse Brodsky at Lawyer’s of Distinction. Turns out he was miffed at our post “When the Top 10% Means Nothing” which exposed his company, Lawyers of Distinction’s Top 10% Award as a charlatan scam. In short, Jesse makes his living peddling overpriced plaques to naive or egotistical lawyers. 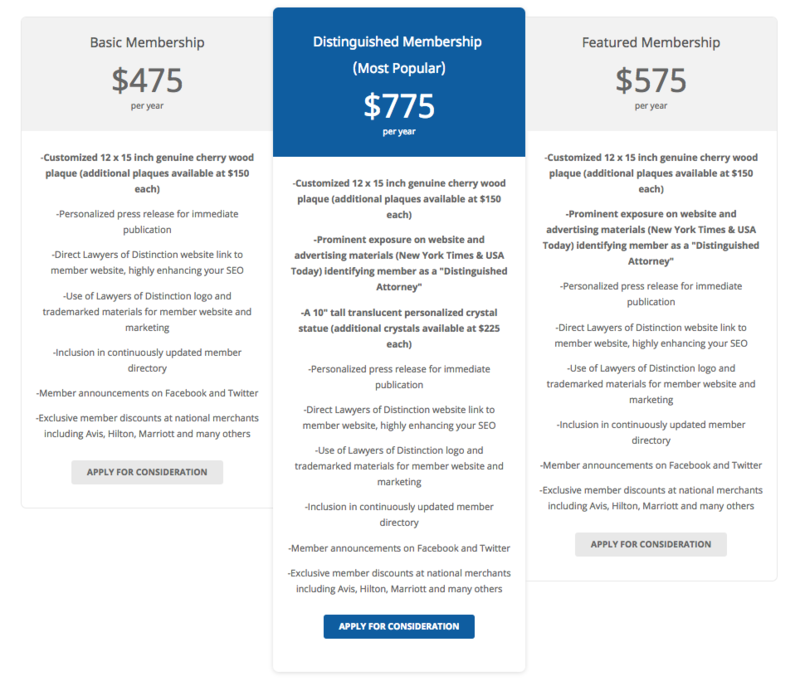 Your article is actionable and we will be initiating lawsuits against the author individually, as well as Mockingbird Marketing if this post is not immediately removed from the internet. you refer to our offices as being in a strip shopping center, when in fact we have a corporate office in a traditional office building. if I were you, the thing I’d be worried about right now is what you are going to eat for breakfast. After that I’d start concerning myself with lunch and then plans for the weekend. I’d put worrying about what you wrote right below whether you are soon to run out of toothpaste. Naturally, I told Brodsky to go stick his head in the sand. Jesse – So nice to finally put a name to your distinguished company. Congratulations on the new office space – if you could kindly forward me the dates of your office upgrade, I’d be most appreciative. Finally, our post will stand. As you may suspect, it is almost impossible to remove a post from the Internet, regardless of pugnacious lawyers. Good luck with your future endeavors. I trust you won’t need to reach out to me again. 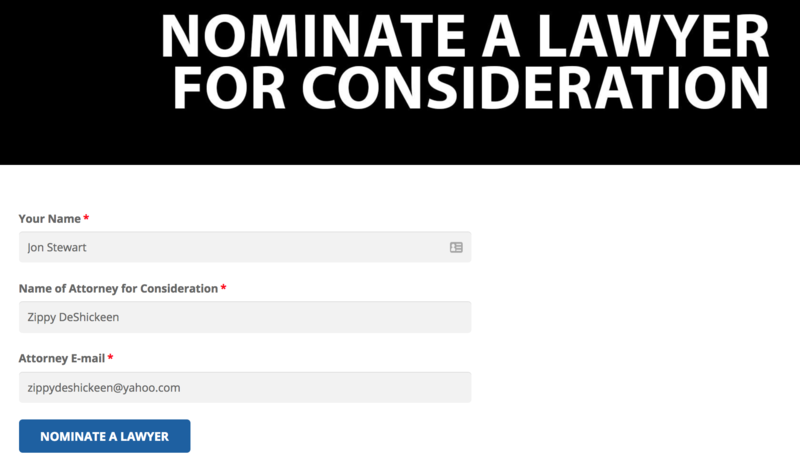 Nominations & Invitations – Candidates are identified either by nomination or by the Lawyers of Distinction organization directly. Nominations are accepted from members of Lawyers of Distinction, fellow attorneys, and current or former clients. Review Application & Background Check – Lawyers of Distinction conducts independent research and background checks to ensure all potential candidates meet LOD standards. The attorney must have no ethical violations within the past five years. Confirmation of Membership – All attorneys who meet the criteria of our screening process have demonstrated a high degree of peer recognition and professional competence, placing them in the top 10% of all attorneys in the United States. 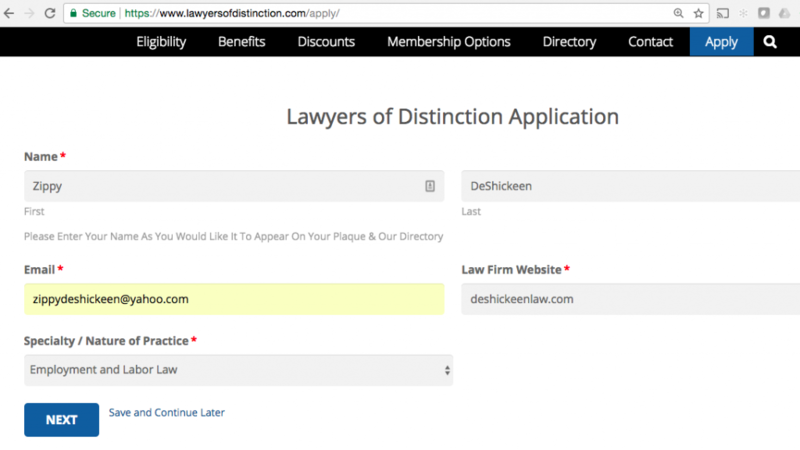 Lawyers of Distinction members have been selected based upon a review and vetting process by our Selection Committee… These potential candidates who meet the criteria of our screening process have demonstrated a high degree of peer recognition and professional competence, placing them in the top 10% of all attorneys in the United States. 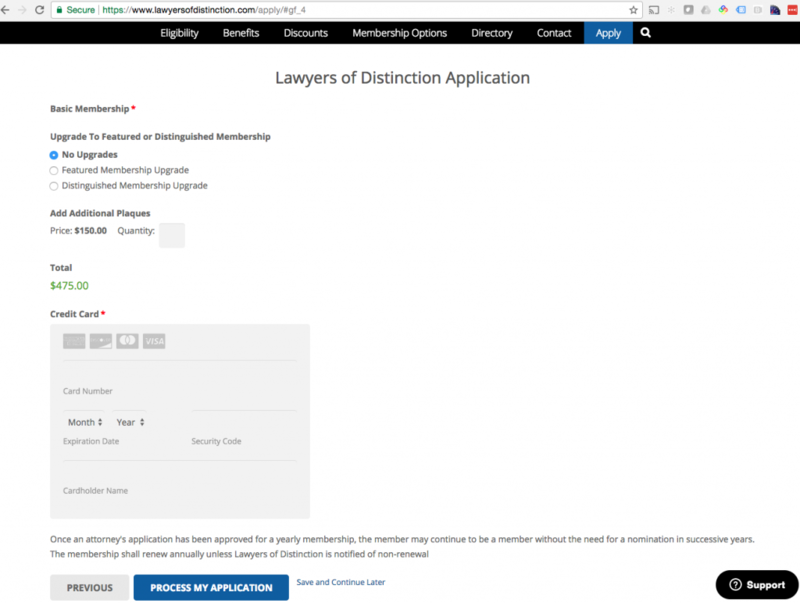 Attorneys may nominate other peers they feel warrant recognition or may nominate themselves. These candidates undergo the same rigorous review process. 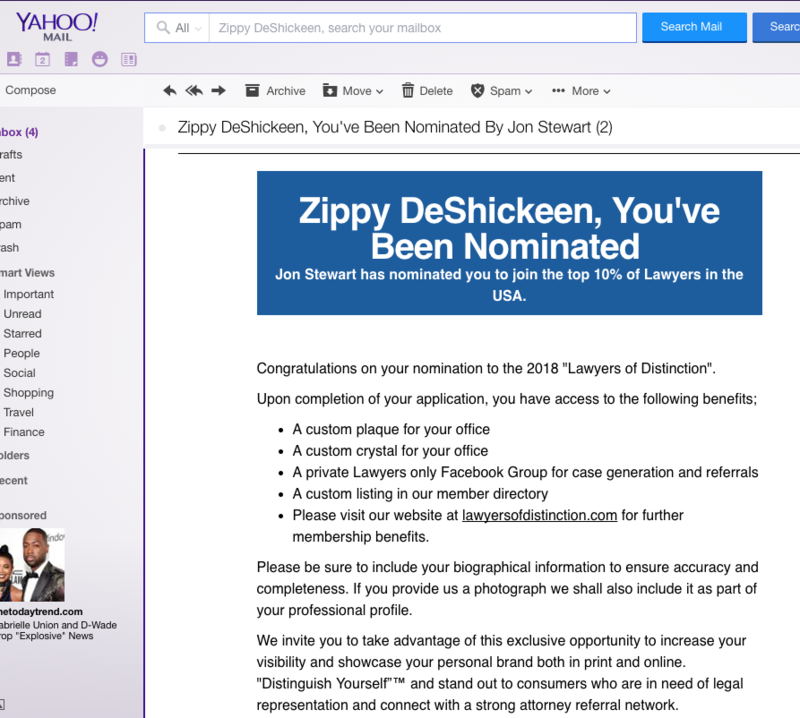 I thought the Jon Stewart reference might be a red flag for Lawyers of Distinction, but a few days later, Zippy’s Yahoo account got mail announcing her nomination and inviting her to take the next step….. The key to this email is this sentence: “upon completion of your application you’ll have access….” So, all Zippy needs to get the plaque is a completed application and $775? Seriously? Apparently no one at LOD bothered to review Zippy’s non-existent website, www.DeShickeenLaw.com before shepherding me to the payment screen. In the next step, LOD was very happy to order up a plaque for a 3 month old hen, placing her in Top 10% Among Lawyers. Now, while I couldn’t bring myself to send Jesse $775 via credit card, apparently, not one, but two different canines footed the bill and have made it through Lawyers of Distinction’s rigorous vetting process. Meet, Shasharoosticus a Lawyer of Distinction (My Dog is Better Than Your Lawyer) and canine to (real) attorney Andrew Tolchin and wait till you hear teacup poodle, Lucy’s acceptance speech. I wanted to know more about Jesse… who is this guy duping lawyers into these overpriced lacquered boards? 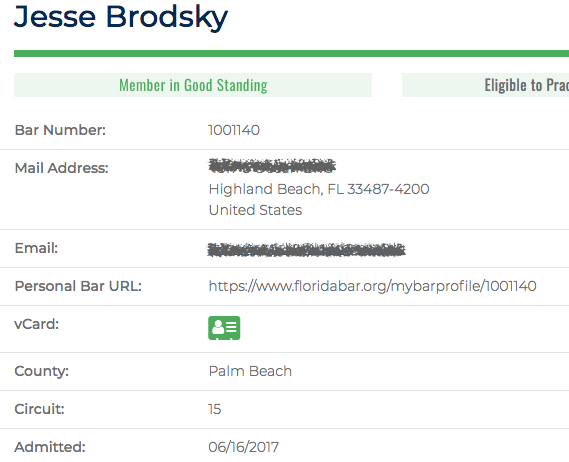 Turns out Jesse Brodsky sent us our C&D just 4 months after being admitted to the Florida State Bar…. 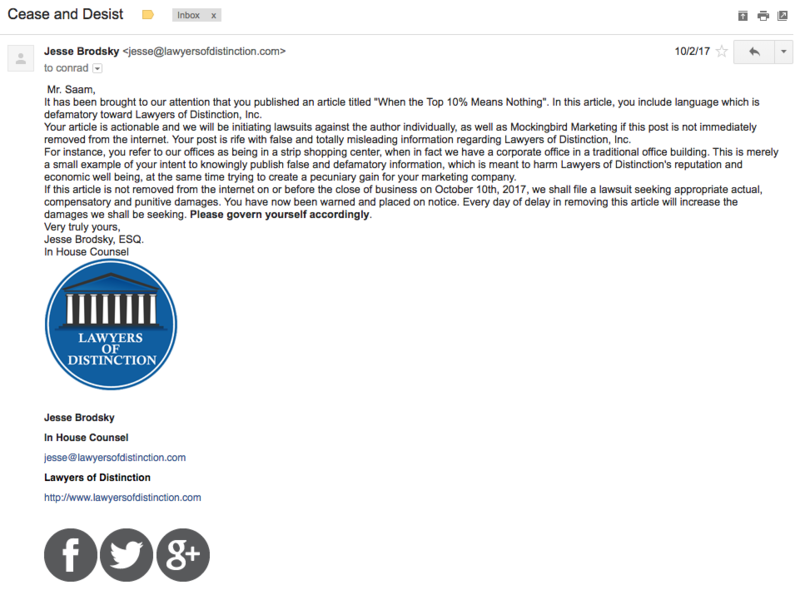 Now, Lawyers of Distinction has really upped their marketing since Brodsky has come on board. Recently I’ve started seeing them more frequently, advertising in legal rags, Twitter and prolifically on Facebook. And they’ve been around since before Brodsky’s first year of law school. I had thought perhaps this was the entrepreneurial endeavor of a feckless law student – as I was unable to find anyone else associated with the company. 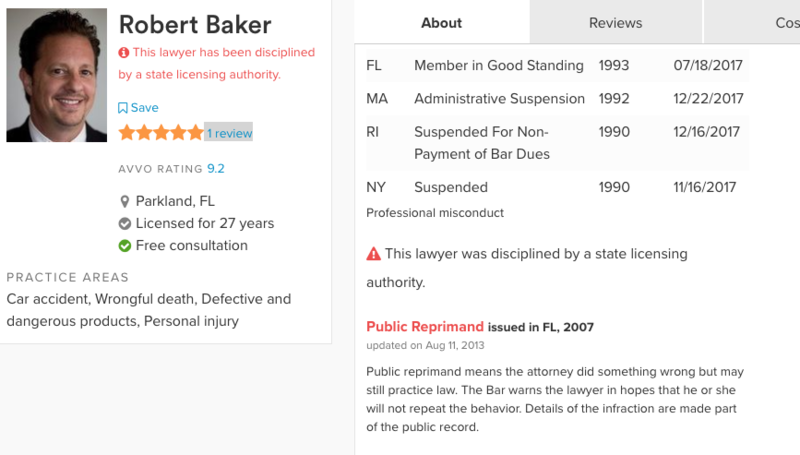 So I looked up Lawyers of Distinction in the Florida Business Directory to uncover, the long term owner, attorney Robert B. Baker of Baker and Zimmerman, who registered the business back in 2009. Ironically, the Baker and Zimmerman site is devoid of any mention of Lawyers of Distinction – in fact neither Baker nor Zimmerman is a recipient. According to Avvo, Baker has been suspended in Massachusetts, Rhode Island, and New York and was reprimanded by the Florida Bar. I’m pretty sure if this makes him decidedly under qualified to vet the Top 10% of Lawyers. All of this brings about serious first amendment issues. During my time at Avvo, we ran into challenges of our right to publish the Avvo Rating and ended up working with Bruce Johnson of Davis Wright Tremaine, the country’s foremost expert on the intersection of the 1st amendment and the Internet. I’ve invited Bruce to join us next week for a webinar called Blogging and the First Amendment. We plan to discuss the legal framework for publishing online content as it pertains to the First Amendment, including the right of Lawyers of Distinction to publish the clearly bogus awards as well as our right to call them to the carpet for doing so. I’d invite you to join us, January 9th at 1:30 Pacific time. 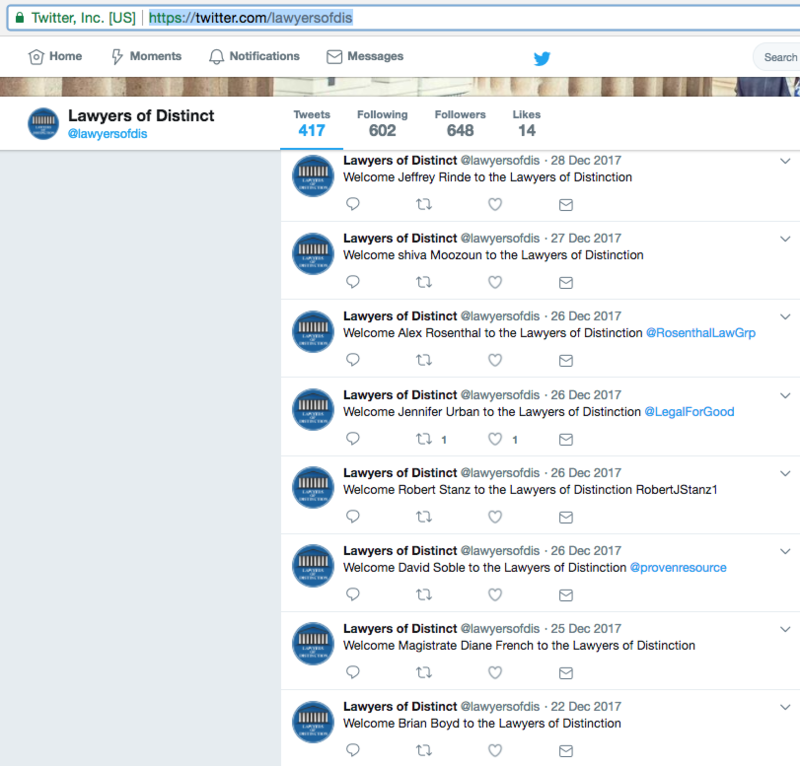 And if you’d like a running log of lawyers duped into this service, try the Lawyers of Distinction Twitter Feed. But you won’t find Zippy on there… she’s too smart. *Brian Tannebaum is not a lawyer of distinction. The only plaques he displays are of his prodigious high end wine collection, and then, only upon specific request. Brian will also recommend 10 great wines under $20. He loves lists. I know how hard Zippy worked for this. Congratulations! Well, that assumes they’re stupid, which they may well be. But I think it’s more likely they are complicit and unethical. They’ll take the bogus certification from LoD, and pass the con on to their marks…er…clients. One of my partners just got a “nominations are open!” spam from them. Address on email is “4700 Millennia Boulevard, Suite 175, Orlando, FL 32839” (including the misspelling of “Millenia”). That is, indeed, a mid-rise office building, and Suite 175 is an office-suite rental outfit. Matt – yeah – I had noted that their vaunted “new” office space was just a temp space as well. Decided not to pile on – but you are right on point. So while it’s still unclear how the membership process “involves” the Committee, what is clear to me is that those of us who have been nominated should feel extremely honored. It took a decision by no fewer than FIVE attorneys (though to be fair, I don’t know if the Committee requires any consensus) after a THOROUGH review of my qualifications. Since I never sent them any materials, I can only assume that prestige radiates from my outdated LinkedIn profile, angry Tweetstorms over customer service incidents, and half-finished dating profile filled with pictures of me putting tiny hats on my cat. Simply stated… Awesome! The LOD post also brought up to mind Super Lawyers… I wonder if there are some similarities?? Regardless, the other interesting item, was the Avvo listing for Baker… 9.2 rating out of 10! Although, Avvo does note that he has prior discipline on file, it makes you wonder about all of these attorney rating/award/marketing services and the evaluation/vetting that does (does not) actually occur. Forward it along…. it’s owned by a Florida lawyer…. 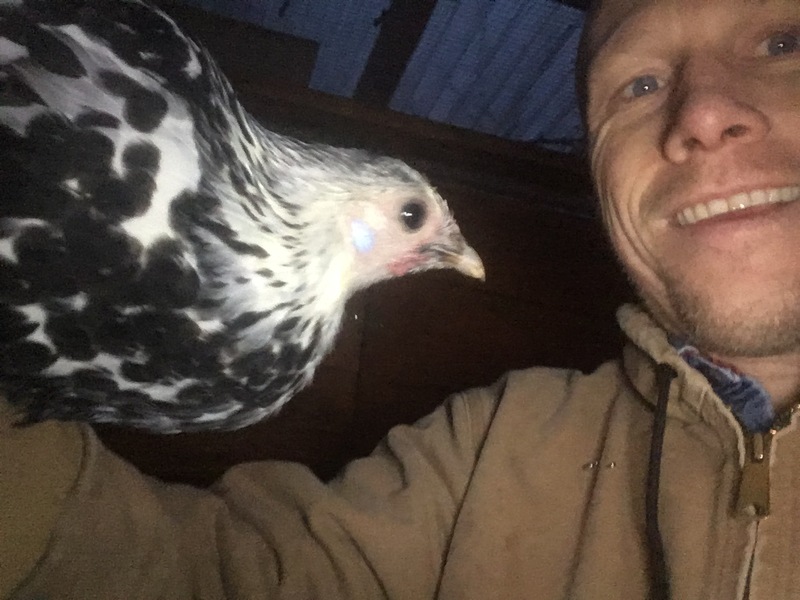 I’ll spend the rest of my career in the knowledge that I am at least as smart as a chicken. Thank you. Thank you Conrad for this valuable public service! Zippy is no doubt very proud of her human companion. In all seriousness, thank you for digging deeper, as I was nominated (er, spammed) earlier today, and instead of responding, googled this and found your very helpful article and “above and beyond” chicken, Zippy! Wow! I, too, received a nomination today albeit not the first time. It had smelled of a scam to me previously but this time I chose to research the company and came upon this post. Thank you for exposing them! Have you thought about alerting the Florida Office Attorney Ethics or the Florida Attorney General regarding these frauds? I’m honored to be among such a distinguished crowd that recognizes a fish when she smells it. I’ve received two emails in the past five days urging me to accept my nomination. The second one prompted me to research LOD and I found this post. Thanks for doing the legwork to confirm what I already suspected.